Wall shelves can be installed easily with metal standards and brackets. They are readily available, inexpensive, strong, easy to install, and adaptable to a wide range of shelving options. They can be used for bookcases, desks and other workspaces, media centers, and closet storage systems. Standards are attached vertically to the wall with screws driven into studs. Brackets can then be placed in the standards to support shelves. Several types of standards and brackets are available, from light-duty to very heavy-duty uses. For most applications, the double-slotted, heavy-duty products are the best choice. You can usually find these in either white or black finishes at Home Depot, Lowe’s, hardware stores, and online retailers. It is always a good idea to start a project with the finished goal in mind. Once you decide on a suitable wall for your shelves, make a sketch of your plan. You will need to decide how high and low you want the top and bottom shelves, how many shelves you need and how long the shelves will be. With that settled and a rough sketch in hand, you will be able to shop for all the materials you need. Plan to buy standards about 10 to 12 inches longer than the intended distance between the top and bottom shelves. When you move, the whole shelving assembly can be disassembled quickly. Fill and paint the holes in the wall, and you can leave things just as they were before the shelves were installed. Use a stud finder to find wall studs. It is imperative that the standards be attached to the wall with screws driven into studs. Studs are vertical framing members to which drywall is attached. They should be spaced 16 or 24 inches apart, measured center to center; note, however, that this spacing can change near doors, windows, and corners. Use a battery-operated or magnetic stud finder to locate the studs in your wall. The former tool will detect the studs behind drywall, while the latter tool senses the nails or screws that hold the drywall to the studs. Move the stud finder straight across the wall, marking each stud location. I like to use short pieces of blue painter’s tape rather than a pencil to mark each stud. When you’re done, you can remove the tape without leaving any mark behind. Mark the studs along the wall where the tops and bottoms of standards will be. You should find that your marks are aligned vertically. If not, check again. With the studs located and marked, the next step is to determine where best to install shelf standards. 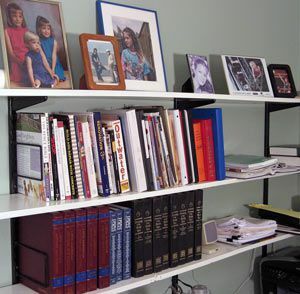 For basic bookshelves, plan to set the standards 32 inches apart on walls with studs spaced 16 inches apart. If your studs are spaced 24 inches apart, plan to attach a standard to each stud. Shelves should overhang the side brackets no more than 6 inches. So, for example, if you planned to use three standards spaced 32 inches from each other (total span of 64 inches from end to end), you could safely use 6-foot-long shelves. For particularly heavy loads, check the manufacturer to determine the best spacing for your standards. It is easiest to attach shelf standards with a helper, although I’ve done the job many times by myself. Set the first standard in place, centered over a stud and at the intended height. When you are satisfied with the location, stick an awl through the top screw hole in the standard, punching a small indentation in the wall. This will make it easier to set and drive the screw. I’ve also found that when you poke a starter hole first, you do less damage to the wall when you drive the screw. Drive a screw through the top hole just deep enough to hold the standard in place securely; don’t make it so tight that you can’t move the standard a little. Now, set your level alongside the standard, adjusting the position so that it is perfectly plumb (that is, vertical). You’ll be plumb when the bubbles in the top and bottom vials are centered. Poke awl holes and drive the remaining screws home. The standards should be just barely snug against the wall; if you drive the screws too far, you may push them into and thereby damage the wall. The shelf standards must be installed plumb, but it is equally important that the brackets, and therefore the shelves, are level across the standards. Set a level across adjacent brackets, sliding the standard up and down until the bubble in the center vial is centered. Make sure that the standard is resting over a stud, then punch a hole in the wall through the top screw hole and drive a screw. Repeat the instructions in step 4 for installing the standard plumb. Repeat the process for remaining standards. Shelf brackets range in size from 5 inches (for shelves holding paperback books) to 24 inches (for desktops and other large spaces). Plan to use brackets that are just a bit shorter than the depth of the shelves. So, if you want shelves that are 8- inches deep, use 7-inch brackets. You don’t have to make all shelves the same depth. Instead, you can install shelves that get increasingly deeper from top to bottom, allowing you to place smaller items on top and bigger items on the bottom, or the other way around. Slip the bracket into the slots on the standard, then give it a little push down to make sure it's set properly. You can buy shelves ready-made or you can make your own. There are several options. Solid wood is the strongest choice, and the only one I feel comfortable with if I’m loading books on brackets and standards spaced 32 inches apart. Shelving that spans 24 inches can be safely made from wood, plywood, melamine and medium-density fiberboard (MDF). Wire shelves are available in light- to heavy-duty options. The least expensive shelving option is to buy large 4-foot by 8-foot sheets of 3/4-inch plywood or MDF and cut your own shelves to size. Often you can have the sheets cut to size, or at least to a size that you can haul home, at the lumberyard or home improvement center. Pre-cut melamine, that glossy white plastic surface so common in kitchen cabinets, does not require any additional finish. The other materials should be painted or, in the case of solid wood and plywood, sealed with a clear wood finish. You need to make sure that books and other items don’t fall off the shelf ends. One tried and true method is simply to stack books on their sides at the ends. I prefer to use the special bookend brackets that slip neatly into the slots in the standards. To use these bookends on the top shelf requires that the shelf is set at least 6 inches below the top of the standards. Bookends are available in several sizes. You may have the best luck shopping for them online. Do You Have These Essential Tools In Your Home Workshop?